On Saturday, Turkish President Recep Tayyip Erdoğan sharply criticized the United States Armed Forces and its N.A.T.O. (North Atlantic Treaty Organization) allies for supplying weapons to Kurdish militias in Syria for free, while refusing to sell defense hardware to Turkey. “We cannot buy weapons from the US with our money, but unfortunately, the US and coalition forces give these weapons, this ammunition, to terrorist organizations for free,” Erdoğan stated in an interview on Turkish NTV news channel. “So where does the threat come from? It comes primarily from strategic partners,” he said, warning that Washington continues to pump in truckloads of weapons into northern Syria. During the interview, the Turkish president unloaded a bombshell that most Americans are entirely oblivious to — Washington and the Trump administration are deploying thousands of trucks jammed packed with guns and ammunition to Syrian terrorist. The United States has recently “sent 5,000 trucks loaded with weapons to northern Syria,” he said. The tweet eerily echoed that famous phrase of a former president, George W. Bush, who announced “mission accomplished” in 2003 to mark the start of the Iraq War, also called Second Persian Gulf War, that would continue for another 8-years until 2011. Even though Trump could have been using the phrase in a different context — the recent delivery of 5,000 trucks packed with military weapons and ammunition via Washington to terrorist organizations in Syria, indicates that fight in Syria is far from over. In recent times, Washington has supplied weapons to the Syrian Kurdish People’s Protection Units (YPG) in the campaign against the Islamic State of Iraq and the Levant (ISIL). The support “infuriated Ankara, which sees the YPG as the Syrian branch of the outlawed Kurdistan Workers’ Party (PKK),” said Press TV. On January 20, Turkey launched an operation against the YPG in the Syrian city of Afrin. 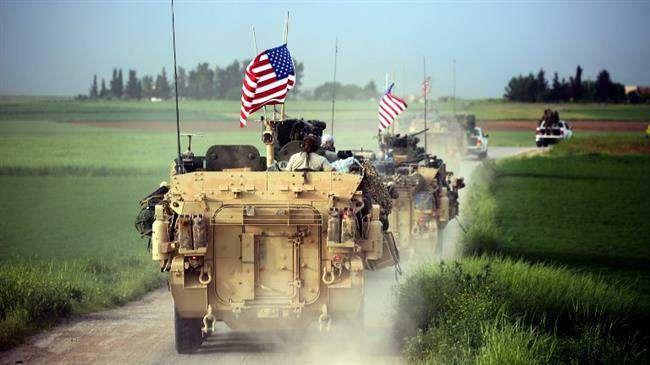 The cross-border invasion of Syria, dubbed Operation Olive Branch, has severely strained relations between Washington and Ankara. Robert Stephen Ford, a retired American diplomat who served as the United States Ambassador to Syria from 2010 to 2014, echoed Montgomery’s comments about the Trump administration’s progress to ease the worries of Ankara. “The American position in northern Syria is strategically foolish and operationally dangerous,” Ford told Middle East Eye news portal, which he is referring to Washington’s decision to arm terror organizations in Syria. While President Trump has told the American people the U.S. would “be coming out of Syria very soon,” there are new claims from Turkish President Erdoğan that Washington is preparing for further conflict by resupplying their proxy armies with more than 5,000 truckloads of weapons.